Many cultures have used baby wearing for a variety of reasons. Some cultures have lost the wisdom behind its use, and many have gravitated to more modern ways, such as the use of a stroller or pram to bring babies along with them on walks and to the store. In pre-historical times mothers had to devise ways to forage and hunt while carrying for babies. Skins, bark, hand-woven reeds, or bark would have been constructed to assist in keeping baby close and safe. 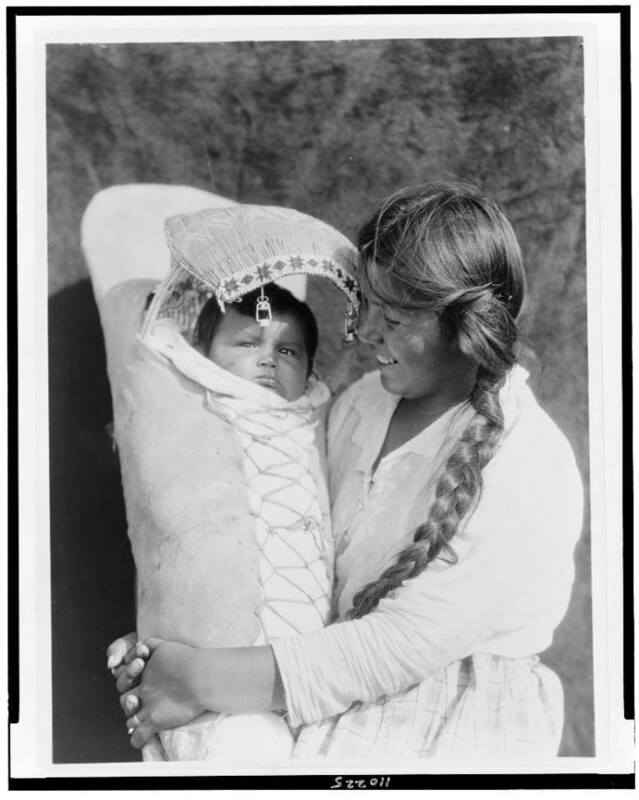 When woven fabrics were invented, women would have utilized long woven wraps or shawls to tie their babies into carrying positions either next to the chest or on their back. Amauti: an Inuit back pouch that was incorporated with the coat, the pouch created when cinched at the waist. The baby was then held high up on the back lying on a bed of fur within the pouch. Dakkohimo or onbuhimo: a Japanese carrier using cloth and straps that would go over the shoulders. It was worn either on the front or the back. It could be used by the mother, siblings, or grandparents. Mei tai: Chinese fabric panel with for straps attached at each corner. The bottom two straps are tied at the waist; the upper two crisscross either for front-carrying or back carrying. The fabric panel supports the whole torso. Podaegi: used by Koreans used a blanket-like appearing traditional wrap that has straps. Infant through toddler-aged were back-carried. Kanga: a rectangular cloth that wraps around both mother and baby to assist back-carrying used in Kenya. Selendang: A rectangular batik cloth that is tucked and folded to form a sling is used by the women in Indonesia. Can’ic’ik’oƞpa: The Lakota “cradle board” using two attached boards for carrying. Around the early 1900s the use of baby carrying or wearing became out of fashion, because of social ideas. It was thought that only poor persons used this method. It was deemed a method of “spoiling” a baby, to spend so much time in such close contact. Last week I ended with discussion about the Lakota belief in a spiritual being who assists the souls of the unborn in their journey to human existence. It is thought she “marks” them before entry into this world. This “mark” is what the medical field calls a “Mongolian” mark. This may not necessarily be understood by present-day women within the culture, but in their soul and spirit the women do recognize that modern medicine’s “managed care” works against the traditions and ageless wisdom of their tribe. This is true whether they have a traditional spiritually based upbringing in their lives or they have adopted non-traditional religious practice. Their sense of “knowing” from their soul, speaks out against what is not natural and spiritual in the birthing process. Western culture encourages reading and the attendance of Childbirth Education classes, along with other strategies for birthing. In traditional cultures women “…prepare more symbolically. They avoid all actions and thoughts that have anything to do with ‘getting stuck’ or ‘closing up’ and ‘letting go’… In traditional societies, women often go to midwives to confirm the pregnancy and then again only if there are special problems… (145)” prior to childbirth. Another aspect is that most women within many traditional cultures would have been directly involved in the childbearing and child birthing aspects from a young age. Her mother or aunts and grandmother would have taught her about the processes of childbearing and childbirth during childhood and/or adolescent years. The concepts would have “…been integrated into her maturity into adulthood (Ibid.)”. It would have come from her experiential life and stories told to her instead of a class or books. Unfortunately, much of this kind of experiential life and tradition has been lost or no longer practiced today by local tribal women. Some of the other women will talk about this or that grandma who was a midwife, and who may have been allowed at IHS for a birth. When I have asked women, they mostly talk about a more negative experience for their childbirth if they speak up at all. Traditionally, the birth of a baby was in the home, not a hospital. Some cultures used “a special hut [that] is constructed for that purpose ;…(Ibid)”. But today in the local area, birthing mostly takes place in a hospital setting, here on the reservation. Locally, there is the IHS. There also is Winner Regional, in Winner South Dakota (45 minutes from Mission, SD) or Cherry County Hospital in Valentine, NE. Due to past experiences with IHS (the “Eugenics Project” of the 60s and 70s, for one), many women may opt to not have their babies unless there is an emergency. Both Winner and Valentine have doctors that have demonstrated certain biases against native women. Without midwives to deliver locally, this is what women on the Rosebud (Sicangu Oyate) Reservation face today (with the exception of one community). Each of these three hospitals has their own regulations as to who may attend the birth. They also decide on whether a woman can have assisted births (Nurse-midwives/doulas/etc.). My attempts to discover these policies, and the reasons for them, have been futile. 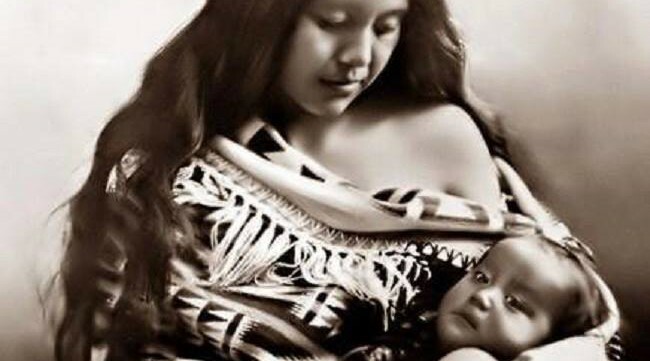 For most indigenous cultures there are concepts taught regarding the spiritual aspects of birth and early childhood. There are beliefs in a female spirit that assists in childbirth, and also assists the soul of the child in “picking” the family in which they will be born. Infants and young children are often considered “sacred beings” and our actions with them must be tempered by this belief. -More next week, in Part 2.